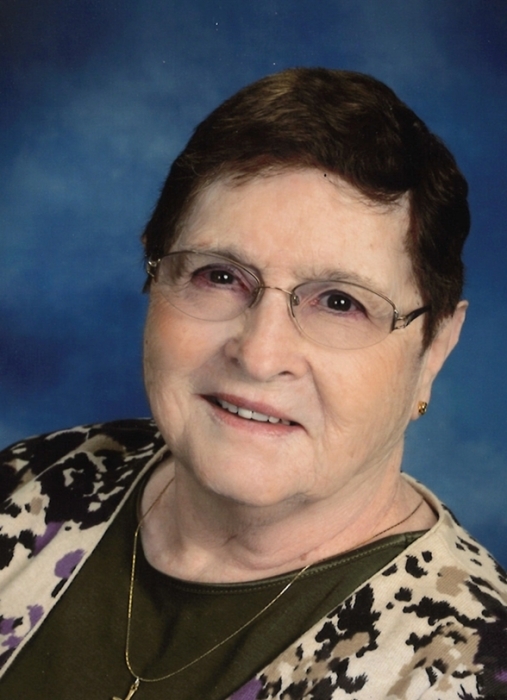 Funeral Services and Mass of Christian Burial for Audrey J. Colson, 89, a resident of Bettendorf, formerly of Davenport, will be 11:30 am Tuesday, April 23, 2019 at Our Lady of Lourdes Catholic Church, 1506 Brown Street, Bettendorf. Burial will be in Davenport Memorial Park. The family will greet friends Monday from 4:00 until 7 pm at Halligan-McCabe-DeVries Funeral Home. There will be a prayer service at 6:00 pm that all are invited to join. There will be additional time to greet the family Tuesday in the Gathering Space at the church from 10:30 am until service. Memorials can be made to Lewy Body Dementia Association, GiGi’s Play House or Kings Harvest Pet Rescue. Mrs. Colson passed away Tuesday, April 9, 2019 at Clarissa C. Cook Hospice House. She was surrounded by her loving family. Audrey Jean Echols was born January 12, 1930 in Davenport, a daughter of Guy Henry and Edna Naomi (Spencer) Echols. She graduated from Davenport High School. She was united in marriage to Richard J. Colson, June 14, 1952 at St. Mary’s Catholic Church, Davenport. He preceded her in death February 8, 2004, after 51-years of marriage. She was employed by the Davenport Community School District, retiring in 1994 after 20 years of service. Audrey worked as a lunch cashier and office aide at William’s Junior High and Buchanan Elementary. She was a former member of Holy Family Catholic Church, and was currently a member of Our Lady of Lourdes. She cherished her four-children, ten-grandchildren, and nine-great grandchildren. She loved traveling with her family. She also enjoyed doing crafts and reading. Her family “loved” her goulash and Scotcheroos! Those left to honor Audrey’s memory include her children and their spouses, Terry and Manuel Camarena, Bettendorf; Mike and Deb Colson, Boise, Idaho; Rob and Kim Colson, and Susie and Todd Zimanek, both of Sherrard, Illinois; grandchildren, Rick Camarena, and his son, Diego; Dan (Lindsey) Camarena, and their children, McKenzie and Corben; Tony (Cristina) Camarena; Tim (Fernanda) Camarena; William Colson, and his children, Dylan and Grace; Jodi (Cameron) Trent; Brandon Franklin, and his daughter, Autumn; Kyle (Emily) Colson, and their children, Kayson, Brylee and Bennett; Taylor Colson (Gavin Williams); and Jacob Zimanek. In addition to her husband, her parents; brother, Robert; sister, Janet; and grandson, Nathan Richard Zimanek welcomed her into Heaven. May they rest in peace. There's still time to send flowers to the Visitation at the Our Lady of Lourdes Church from 10:30 AM to 11:30 AM on April 23, 2019.